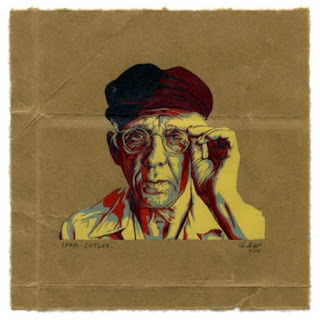 E c'è sempre (almeno) un buon motivo per riascoltare Ivor Cutler, in particolare quando la BBC estrae dagli archivi qualcuno dei suoi numerosi e preziosi documenti. Proposto cinque anni addietro per festeggiare i novant'anni dell'inimitabile assurdista - che infatti se n'era andato a ottantatré - l'episodio Ivor Cutler at 90 è tornato disponibile sul web un paio di mesi fa, con l'impeccabile presentazione (e una speciale performance con Phyllis King) di David Bramwell. Championed by everyone from the Beatles to Billy Connolly, Ivor Cutler was a poet, humourist and absurdist whose appearances on BBC radio and television span over five decades. As well as producing a vast body of records, books and plays, Ivor was a notable eccentric, often seen cycling around London in plus fours, handing out homemade stickers and badges to strangers. To mark what would have been Ivor's 90th birthday, BBC Radio 4 held a 'party', to celebrate his life and BBC archive in particular. Expect a full house, with performers, fans, collaborators and even his long-term partner, Phyllis King, introducing their favourite poems, songs and memories of Ivor. Weirdness from the archives, pleasure for fans, and a singular introduction to those encountering him for the very first time. Highlights include Bramwell and King re-enacting a morse code performance of The Little Black Buzzer.